An RSS feed notifies you when web content has changed on a server. RSS feeds are used to publish news articles, blog updates, etc..Adding an RSS feed to WebClient is straightforward and simple. Now select the location in which you want to place the RSS folder. 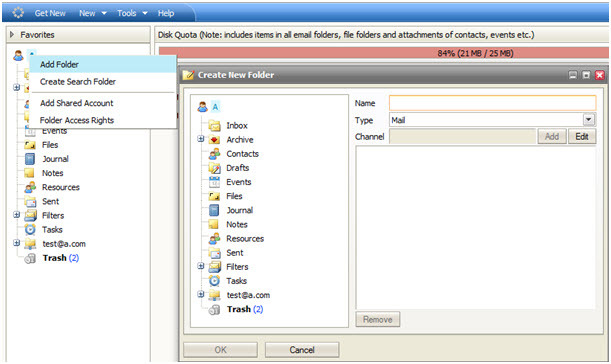 If you select your user name,the RSS folder will be added at the root level. Enter the name of the new folder, select type: RSS, type in the URL of the RSS feed and press the Add button. The RSS folder may contain a single feed or multiple feeds. To assign multiple feeds to one folder, simply add more feeds at this time. If you added all the feeds that you want to have in this folder press ok. A new folder will appear in your folder tree. If you will select this folder you will see the RSS feed’s new articles. RSS updates usually consist of a link to an article or a brief message with a link to the full article.